At the end of each fall, programs submit annual SLO assessment plans and each spring, programs provide SLO reports that provide data on the assessed outcomes. These reports include a description of the effectiveness measure, information on the scaffolding of learning that takes place prior to assessment, the methodology of assessing the SLO and sharing the data with the program's constituents, and a reflection on the learning process, as well as, any proposed changes to be implemented as a result of the SLO data trends. Each program establishes an acceptable target for student achievement such as “80% of students will obtain a rating of "meets" or "exceeds" on the assignment rubric.” The results of the assessment act as one source of evidence about student learning. Below is an example of SLOs and their assessment in the College of Health and Human Services (CHHS). Concepts behind each Student Learning Objectives are introduced to course materials and assignments, develop further in subsequent course material and finally, assessed by a direct measure, which demonstrates the student's mastery of the competency. The introduction, development and assessment of a Student Learning Objective can span several courses and will be highlighted in the syllabi of those courses. 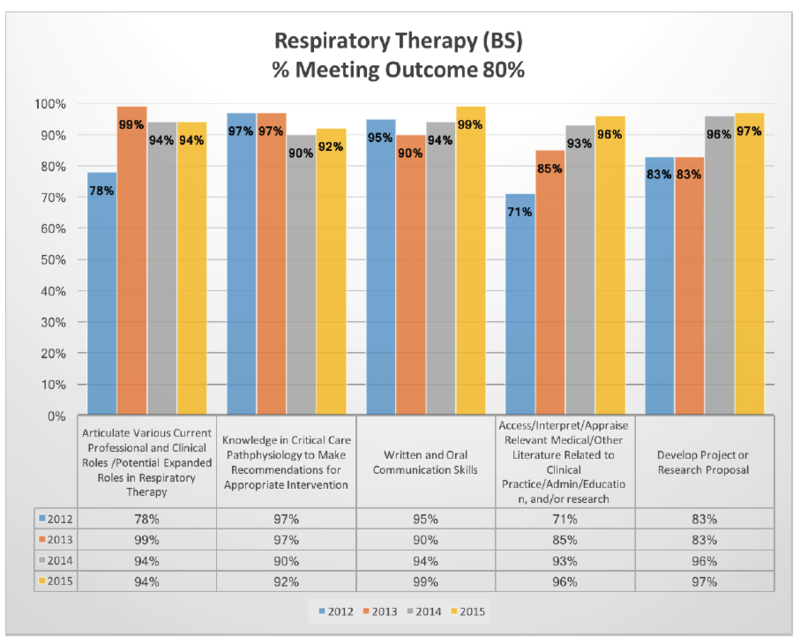 Students will articulate various current professional and clinical roles and potential expanded roles related to the respiratory therapy profession including describing professional behavior, reviewing the history of respiratory therapy, monitoring the quality of respiratory care and listing changes in technology and knowledge base. Students will demonstrate knowledge in critical care pathophysiology to interpret pertinent clinical information to make recommendations for appropriate therapeutic intervention. Students will demonstrate the ability to access, interpret, and critically appraise relevant medical and other authoritative literature related to clinical practice, administration, education, and/or research associated with the respiratory therapy profession. Students will develop an original project or research proposal related to clinical practice, administration, education, and/or research associated with the respiratory therapy profession. Students will demonstrate the ability to solve complex clinical situations while serving as a member of an interprofessional team taking into consideration the viewpoints of all members of the team with the focus on patient centered care.